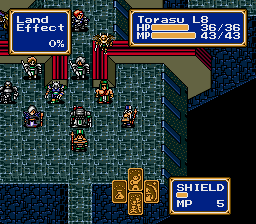 Shining Force came out in Japan in 1992 and a year later in the US. It was one of the more popular strategy games in the era. Most console strategy games either copy Shining Force or use elements copied by Shining Force. The first game in the series really has only one remarkably awkward element. 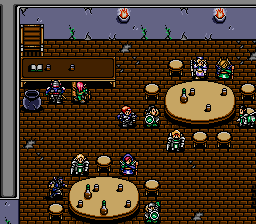 The team in Shining Force relaxing in their base. In the game, you collect multiple characters for your force. They can be “promoted.” This unlocks new abilities and changes their look in battle. To be promoted, you need to reach a certain level, and then promote the character. Levels are gained by actions in battle. This means that healers (who can spam healing magic) tend to gain far more levels compared to other characters. This healer is preparing to cast magic in battle. For every attack or magic spell, there's an animation unique to the character type. Certain characters are merely different colored versions of other ones. The characters don’t tend to be perfectly balanced. Usually, there’s a ton of knights (spear or javelin using centaurs,) a few mages, some high defense dwarves, and some other soldiers. Some are utterly broken when it comes to strength and ability or utterly useless. That’s not that uncommon in strategy games. The Land Effect of 0% is due to the smooth pavement. The little animated icons is a very recognizeable feature in Shining Force menus. Moving is on a grid based system dependent on movement range and terrain. Certain types of ground (like forests) provide slow movement, but good cover. 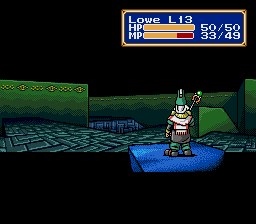 Unfortunately, Shining Force tends to have trigger zones that encourage monsters to head toward you. This means that there’s a bit of experimentation to avoid drawing too much enemy attention. 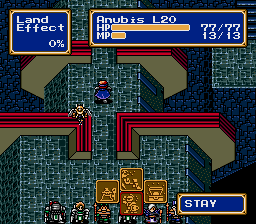 Preparing to cast magic in Shining Force uses the same menu. The square below Shield is the power level of the spell. The worst part of the game is actually an early battle. In a circus, a seemingly innocent battle against puppets suddenly becomes very deadly due to the boss of the area. It has high level magic that can hit several characters, and a fairly high amount of magic. Once you’re strong enough to handle the fight, you’re usually strong enough to breeze through the rest of the game.